There are certain restaurants that I get wind of due to social media and/or blog posts. But I tend to set them aside in my mind for another day (because I don't want to overload my brain, it will crash due to lack of RAM). 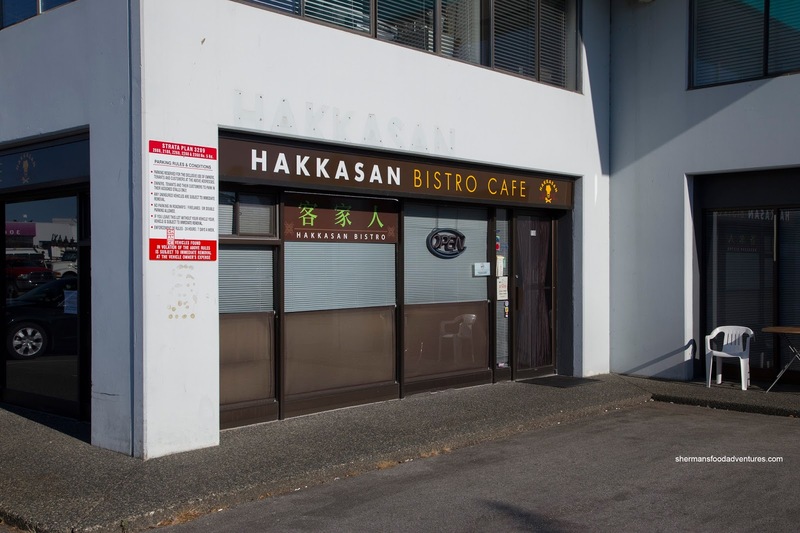 So when we were scheduled to visit Hakkasan Bistro for a ChineseBites dinner, I wasn't really aware where it was located. I have always assumed it was situated in restaurant central aka #3 Road (or accidene central to some). Little did I know that it would be smack dab in the middle of a predominantly industrial area on #5 Road near the International Night Market. Let's just say one wouldn't expect such a nice little place would exist amongst auto modification shops (actually, I almost missed the restaurant because I was admiring all the nice tricked-out cars...). 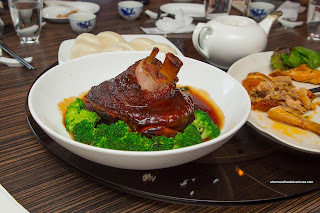 So onto the food, we were presented with the Honey Roasted Pork Cheeks which did its best impersonation of BBQ pork. Now unlike BBQ Pork, the meat was much more uniform in texture with the classic rebound and buttery chewiness. Sweet with definite caramelization, the cheeks featured an appealing bark on the outside. With what I can only describe as one of the best dishes I've had in a long time, we were served one Whole Coconut Pork & Snow Fungus Soup each. Normally, most serving vessels are meant for visuals and wow factor. Not in this case as the sweet flavourful chicken broth took on the aromatics of coconut. 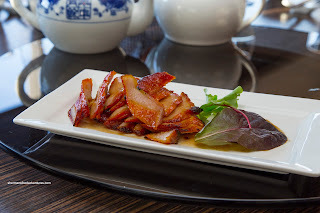 Each nugget of pork was succulent while the crunch of the snow fungus added texture. 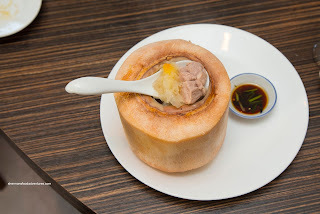 The best part was when we scraped off the tender coconut meat on the inside, pure enjoyment right there. 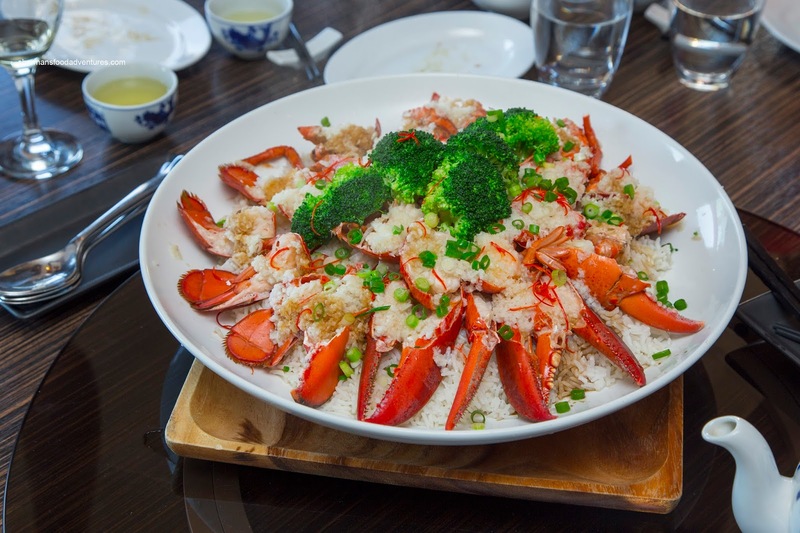 Majestically-plated, the Steamed Odorless Garlic Lobster atop Jasmine rice was served next. As much as there was a significant amount of minced garlic enveloping the pieces of lobster, the taste was subtle and yes "odorless". I was a bit torn with this as I appreciated the fact Viv would still kiss me when I got home, but at the same time, the dish was missing pungency. Despite this, the lobster itself was cooked beautifully being tender with the classic rebound texture. 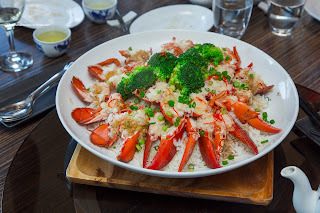 As for the rice, I felt there was too much of it where there wasn't enough lobster juices to go around. Furthermore, it was mushy due to the moisture involved. Possibly a fried rice base would've been better. On the other hand, the rice was necessary for the subsequent dishes such as the Ancient Style Salt Baked Chicken. 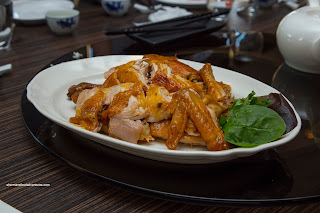 Wrapped in parchment, buried with salt and baked in a clay pot, the result was a intensely-flavoured chicken which exhibited a concentrated natural sweetness accented by the saltiness. The meat was also moist as the chicken cooked in its own juices. The wow factor continued with the really large Braised Pork Hock served with mini-mantou. I took the reigns in divvying it up and for the most part, it cut like butter. Naturally, there were some drier parts due to the lack of fat or collagen. Yet, the majority of the meat was gelatinous and fork tender. It was also well-seasoned with the silky sauce (thanks not only to starch, but the gelatin from the pork hock) having a sweeter flavour. With all this meat, it was only a matter of time we moved onto a veggie dish (well, if we wanted a more balanced meal that is...). It happened to be the Stir-Fried Yau Choy dressed with a mui choy "sauce". 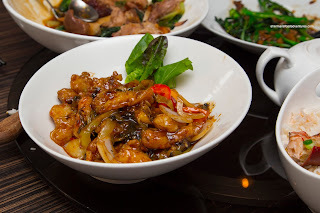 I put sauce in quotations because it was more like a glaze with bits of salty pickled mui choy. 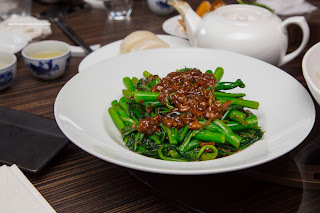 The yau choy was cooked up properly (albeit a touch greasy) where it retained a vibrant crunch as well as retaining a rich green colour. 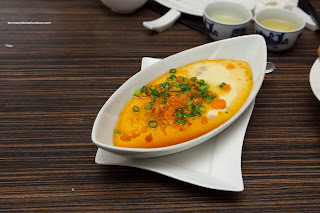 Next, we were presented with the Hakka Homestyle Steamed Egg with ground pork and salted duck egg yolk. I make this dish at home often, but this one was much more refined with silky egg that did not exhibit any air bubbles nor excess water. Hidden inside was well-spread out and moist ground pork while the whole thing was topped with stir-fried salted duck yolk. Our last savouy item was the Stir-fried Fish with Pickled Cabbage. I felt this was the weakest dish of the meal as there was far too much grease. The entire dish felt heavy and was not pleasing to the palate. As much as the fish was flaky and moist, the exterior was completely oil-logged. Furthermore, the dish was over-seasoned being quite salty. 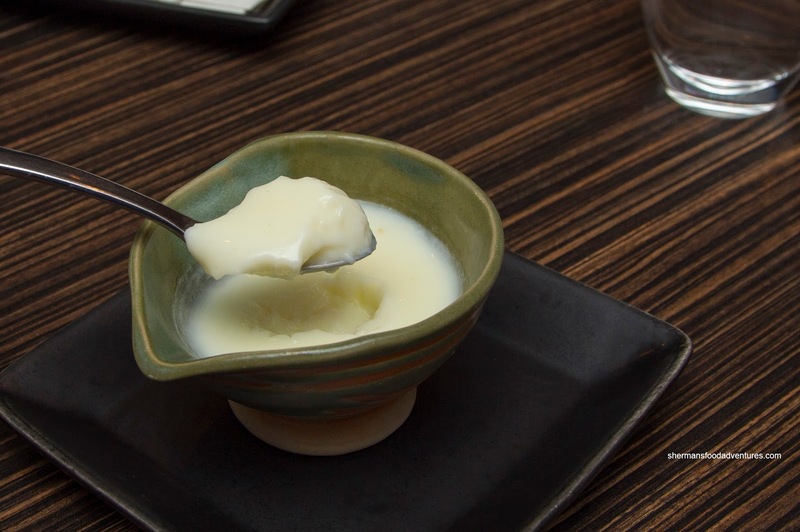 We ended off things with a light dessert being the Steamed Milk Egg White Custard. It was extremely delicate and beyond silky. What I mean is that the custard almost had no texture at all, hence it ate very easy. In terms of taste, there was very little sugar which meat I could actually taste the egg whites. This was probably the best way to finish off what was heavy meal. Overall, I was quite impressed with several of the dishes including the pork cheek, coconut soup and steamed egg. It definitely piques my interest where I would probably be back to investigate the menu further.